A UDRP was filed against the three letter .com domain name, DVT.com. The UDRP was filed at the World Intellectual Property Organization (WIPO). It is WIPO case #D2018-0738. DVT.com is a high value LLL.com domain name that was created back in 1995. The domain name appears to be registered privately, so I am unsure of who the registrant is right now. Archive.org shows that the domain name had been used several years ago as a website for an entity called Delta Vortex Technologies. The complainant in the UDRP is a company called Dynamic Visual Technologies (Pty) Ltd. A Google search for that company shows that it is likely the company that operates on the DVT.co.za ccTLD domain name. .co.za is the ccTLD for South Africa. Whether the company tried to buy the domain name using the inquiry form at the top of the landing page is something we will likely learn when the decision is published. I wouldn’t be surprised if the company tried to buy it but decided to use the UDRP process as a “plan B” alternative. If I was to guess, I would say the domain owner will retain the domain name. 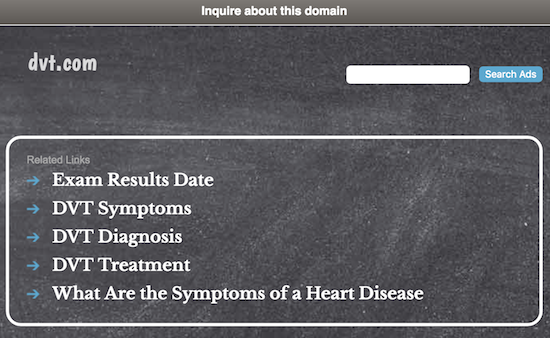 Three letter .com domain names like DVT.com hold considerable generic investment value, and the domain name is being used to generate pay per click revenue related to the DVT medical condition. Plenty of other UDRP panels have ruled that generating revenue on generic domain names is a perfectly legitimate business model. I don’t see how the complainant will be able to prove that the domain name was registered and is being used in bad faith (it needs to prove both of these things to succeed). I would also not be surprised to see a Reverse Domain Name Hijacking ruling (RDNH). Update: UDRP complaint was denied. It does not appear that Reverse Domain Name Hijacking was considered because it was not mentioned in the decision. So many of these ex-USA UDRP filers exhibit a strong entitlement mentality. They act so indignant and victimized that they cannot simply be granted the domain name that they want. To have to pay market value for a LLL.com just infuriates them. So, they go with “Plan B” when they feel that their business truly isn’t worth paying market price for the digital asset they so jealously covet. Their lawyers should be ashamed of themselves for not advising their clients appropriately and simply taking on the sure-to-fail case just to generate the billable hours. In court, if a domain owner would lose, they would lose the domain name and likely have to pay a financial penalty. Should that also apply? I am sure if the rules changes to penalize complainants that try to reverse hijack a domain name, they would also apply penalties to domain registrants that lose. If a UDRP filing costs less than $1,500 for many of these companies; they seem to feel it is worth a long shot to file rather than pay; what penalty besides a paper RDNH do they receive? ANYTHING THAT YOU DON’T PAY = YOU DON’T OWN! Interesting too is that I couldnt find a DVT trademark registered by Dynamic Visual Technologies, US or international. I did however find plenty of other active marks for DVT.